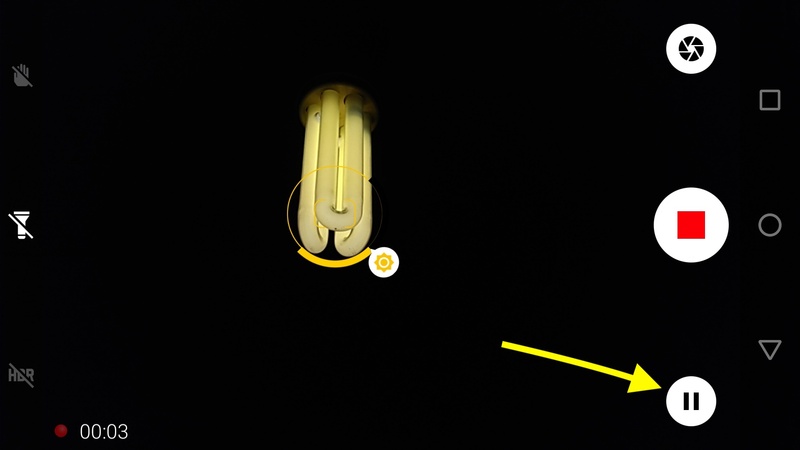 UI of Motorola’s native camera app (“MotoCam”) while recording video. Bottom right is the “pause” button that will let you pause the recording and resume it later if you don’t leave the app. The feature that makes it possible to already edit a video package within the camera app itself while shooting is the ability to pause and resume a recording. The most common way to record a video clip is to hit the record button and then stop the recording once you’re finished. After stopping the recording the app will quickly create/save the video clip to be available in the gallery / camera roll. Now you might not have noticed this but many native camera apps do not only have a „stop“ button while recording video but also one that will temporarily pause the recording without already creating/saving the clip. Instead, you can resume recording another shot into the very same clip you started before, basically creating an edit-on-the-go while shooting with no need to mess around with an editing app afterwards. So for instance, if you’re shooting the exterior of an interesting building, you can take a wide shot from the outside, then pause the recording, go closer, resume recording with a shot of the door, pause again and then go into the building to resume recording with a shot of the interior. When you finally decide to press the „stop“ button, the clip that is saved will already have three different shots in it. The term I would propose for this is „shediting“, obviously a portmanteau of „shooting“ and „editing“. But that’s just some spontaneous thought of mine – you can call this what you want of course. What camera apps will let you do shediting? On Android, actually most of the native camera apps I have encountered so far. This includes phones from Samsung, LG, Sony, Motorola/Lenovo, Huawei/Honor, HTC, Xiaomi, BQ, Wileyfox and Wiko. The only two Android phone brands that didn’t have this feature in the phone’s native camera app were Nokia (as tested on the Nokia 5) and Nextbit with its Robin. As for 3rd party video recording apps on Android, things are not looking quite as positive. While Open Camera and Footej Camera do allow shediting, many others like Filmic Pro, Cinema FV-5, Cinema 4K, Lumio Cam and ProShot don’t have this feature. When looking at the other mobile platforms, Apple still doesn’t have this feature in the iOS native camera app and the only advanced 3rd party video recording app that will let you do it appears to be MoviePro. And while almost extinct, Lumia phones with Windows 10 Mobile / Windows Phone on the other hand do have this feature in the native camera app just like most Android phones. Sure, shediting is only useful for certain projects and situations because once you leave the camera app, the clip will be saved anyway without possibility to resume and you can’t edit shots within the clip without heading over to an editing app after all. Still, I think it’s an interesting tool in a smartphone videographer’s kit that one should know about because it can make things easier and faster. EDIT: After I had published this article I was asked on Twitter if the native camera app re-adjusts or lets you re-adjust focus and exposure after pausing the recording because that would indeed be crucial for its actual usefulness. I did test this with some native camera apps and they all re-adjusted / let you re-adjust focus and exposure in between takes. If you have a different experience, please let me know in the comments!